Parents who suspect that artificial ingredients in food are affecting their children's behavior can now point to some cold, hard proof. A carefully designed study released Thursday in The Lancet, a leading British medical journal, shows that a variety of common food dyes and the preservative sodium benzoate  an ingredient in many soft drinks, fruit juices, salad dressings and other foods  causes some children to become more hyperactive and distractible than usual. "In terms of a question that's been raging for years, it's the best study to date  an extremely good study," says Dr. Philip Shaw, a research psychiatrist in the Child Psychiatry branch of the National Institute of Mental Health. The study prompted Britain's Food Standards Agency to issue an immediate advisory to parents to limit their children's intake of additives if they notice an effect on behavior. In the U.S., there's been no such official response, but doctors say it makes sense for parents to be on the alert. Meanwhile, the food industry is awaiting further research. "We take our responsibility to consumers seriously and will study the research finding in great detail," says Cathy Cook, spokesperson for the International Association of Color Manufacturers. The research, led by Jim Stevenson, a professor of psychology at England's University of Southampton, involved about 300 children in two age groups: 3-year-olds and 8- and 9-year-olds. Over three one-week periods, the children were randomly assigned to consume one of three fruit drinks daily: one contained the amount of dye and sodium benzoate typically found in a British child's diet, a second drink had a lower concentration of the additives, and a third was additive-free. All the children spent a week drinking each of the three mixtures, which looked and tasted alike. 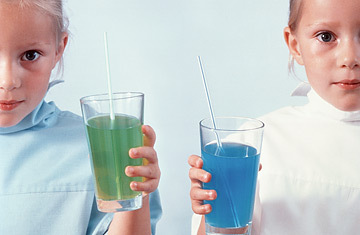 During each weeklong period, teachers and parents, who did not know which drink the kids were getting, used a variety of standardized behavior-evaluation tools  some observational and one computer-based  to size up such qualities as restlessness, lack of concentration, fidgeting, and talking or interrupting too much. Stevenson found that children in both age groups were significantly more hyperactive when drinking the stuff containing additives. Three-year-olds had a bigger response than the older kids to the lower dose of additives  roughly the same amount of food coloring as in two 2-oz. bags of candy. And, there were big individual differences in sensitivity. While the effects were not nearly so great as to cause full-blown ADHD, Stevenson nonetheless warns that "these adverse effects could affect the child's ability to benefit from the experience of school." He notes that a separate pilot study found that kids can become more hyperactive within one hour of consuming food additives. The Lancet study is the first to nail down a link between artificial ingredients and hyperactivity, though the connection has long been suspected and was the basis for the Feingold Diet, which eliminates all artificial colors, flavors, sweeteners and preservatives and was popularized in the 1970s as a treatment for ADHD. Though such a diet alone is not a proven treatment for ADHD, some clinicians routinely advise parents of kids with ADHD to stick with a more natural diet." I'm not maniacal about it, but I tell parents that your kid will do better if they are on a diet that is free of additives and junk food," says psychiatrist Edward Hallowell, author a several books on ADHD. "I urge them to eat whole foods; they'll be healthier anyway." Now that a link has been found, researchers will be looking to confirm the British study and build upon it. "My guess is that if we do similarly systematic work with other additives, we'd learn they, too, have implications for behavior," says Dr. James Perrin, professor of pediatrics at Harvard. "My friends who study the food industry say we have about 70,000 new products a year, so children are facing tremendous numbers of new opportunities for things that may not be good for them." The study, he says, is one more reason to cheer the movement toward organic and natural foods.